The Stratford Zoo looks like a normal zoo . . . until the gates shut at night. That's when the animals come out of their cages to stage elaborate performances of Shakespeare's greatest works. They might not be the most accomplished thespians, but they've got what counts: heart. Also fangs, feathers, scales, and tails. 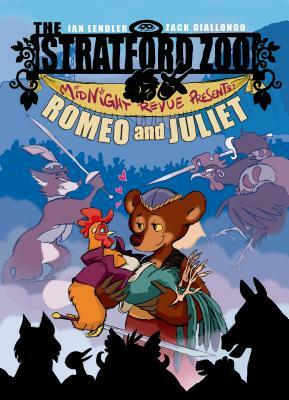 Ian Lendler's hilarious tale of after-hours animal stagecraft is perfectly paired with the adorable, accessible artwork of Zack Giallongo (Broxo, Ewoks) in this side-splitting companion to their graphic novel The Stratford Zoo Midnight Revue Presents Macbeth. Zack Giallongo is a professional cartoonist, cheese enthusiast, and amateur banjo-ist. His first solo graphic novel, Broxo, is about teenage barbarians and was published in 2012. It hit #4 on the New York Times Bestsellers list. Ian Lendler is the author of the acclaimed Stratford Zoo graphic novel series and the picture books, Undone Fairy Tale, Saturday, and One Day A Dot. He is at one with the universe, but only when eating pizza. He lives near San Francisco, CA.